Wagoner Lawyer Blog Facing a Possession of a Firearm After Commission of a Felony Charge in Wagoner: What Now? The right to bear arms is guaranteed by the Second Amendment to the U.S. Constitution. But that right is not absolute. States have the right to regulate the possession of firearms. One of the ways states like Oklahoma do so is to regulate who is allowed to possess and carry. Oklahoma law prohibits possession of a firearm after the commission of a felony. This prohibition extends to felons who are on probation or who are under the jurisdiction of an alternative court program of any kind. Alternative court programs can include drug court, Anna McBride, mental health court, DUI court, or veterans court. The only exception to this is a person who has previously been convicted of a nonviolent felony and who has received a full and complete pardon from the proper authority. That person may have the right to possession of a firearm restored if he or she has not been convicted of any other felony offense which has not been pardoned. This can be problematic if a person brings a firearm into your home without your knowledge, or if someone is in possession of a firearm inside the car that you are driving or riding in — even if you do not know that this person is in possession. If you are caught riding in a car and your buddy next to you is carrying, you could be convicted. There are defenses out there. 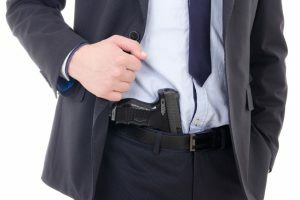 If you are facing charges for possession of a firearm after a felony conviction, it is important that you contact a Wagoner defense attorney as soon as possible. Facts that don’t seem important to you now may prove critical in building a strong defense.